Sometimes just one plant in a container is all you need. Or in this case, just one type of plant. I planted this sedum in this container because I ran out of other plants earlier this spring and this poor pot was still empty. This stuff grows up between the bricks of the brick patio, and in the flower beds all around, so I have plenty of it to share. 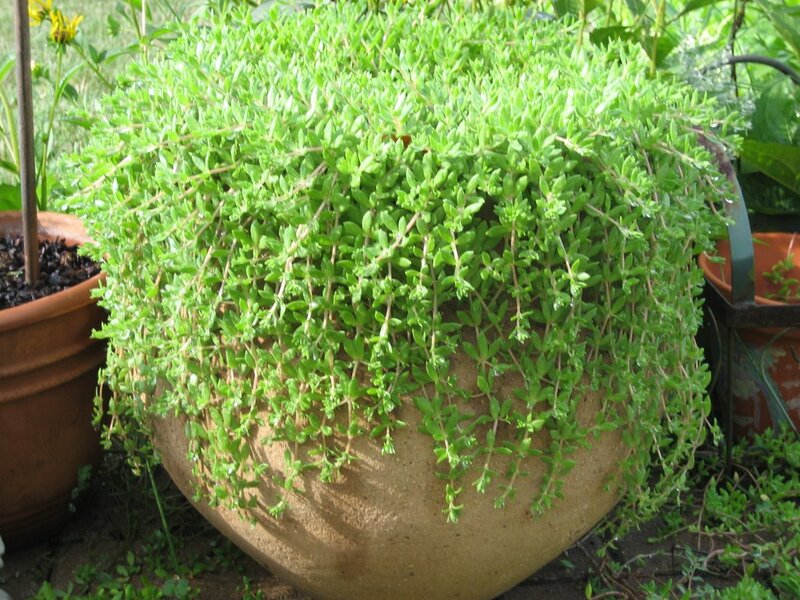 Anyway, my aunt was going from my house to the Brickyard 400 race at the Indianapolis Motor Speedway, on a day that was going to be very hot, so we put the sedum in a plastic bag and she placed it in her cooler. She later reported that the sedum made it through the race and return trip home and grows nicely in her container every year. So when I couldn't decide what to put in this container, I thought of my aunt having a container of this stuff, and decided I should do the same. I literally grabbed a handful of sedum from around the patio and planted it up. I think come October, I'll move it to the front porch, put a face on the container and make it my "jack-o-lantern". Our sedum is still going strong. At times it is so full and beautiful and other times it looks like it is dying, But it always comes back. I just leave the container out all winter and come Spring, the sedum comes back hardier than the year before. Thanks again for sharing yours with us. The sedum in the old family container is probably 100 years old. It does not like fertilizer.